Power dressing is not a modern phenomenon, as the new exhibition Charles II: Art and Power at The Queen’s Gallery amply shows. The exhibition opens with Edward Bower’s remarkable portrait of King Charles I at his trial before the High Court of Justice in the Great Hall of the Palace of Westminster in January 1949. It is obvious that the King knows exactly how to convey his contemptuous refusal of the court’s right to try an anointed king. He sits on a red velvet armchair – and refused either to stand or to take off his hat – his accusers were not his equals and he didn’t owe them any courtesy. His hat is tall, wide-brimmed and visible; it must have been carefully chosen to make the maximum impact. The King also wears the blue sash of the Order of the Garter, an honour dating back to 1346 and restricted to the monarch, members of his family and carefully chosen aristocrats. His garter star is proudly displayed on his left arm. Both the star and the blue garter sash show up clearly against the black of the rest of his clothes. The King doesn’t need to state his belief in the Divine Right of Kings – his clothes make the statement for him. Interestingly, Edward Bower, who made sketches throughout the trial and was a supporter of the Commonwealth, depicts the king sympathetically and his portrait conveys a sense of Charles’s dignity. 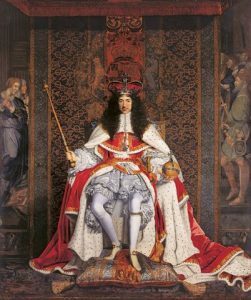 Charles II was equally aware of the importance of power dressing, though in a completely different way, as his coronation portrait shows. Oliver Cromwell’s Protectorate had many things to its credit but its general effect was a sort of dull sobriety. Whatever else John Michael Wright’s portrait says about Charles II, he could never be described as dull. The King is resplendent in his scarlet Parliamentary coronation robes, trimmed with ermine, worn over his Order of the Garter costume, in a lavish silver silk, with the garter prominently displayed at the top of his left calf. 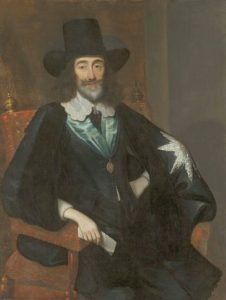 Whereas Bower’s portrait of Charles I showed him sitting with his legs confined by the arms of his chair, Charles II couldn’t be more different. He sits, knees splayed in an undoubtedly masculine pose, emphasized by the sceptre he’s holding at a jaunty angle in his right hand and a large, highly decorated orb in his left. He is also showing off a shapely pair of legs. He is not confined by his throne; his robes are overflowing it, and his feet are firmly planted on an embroidered and be-tasselled cushion. He is wearing St Edward’s crown, which is also, symbolically speaking, spreading its legs. I have seen various crown bases stripped of their jewels, which, initially, surprised me but it makes sense; different monarchs have different sized heads and need their crowns altered to fit. The crown Charles II wore might contain the same jewels as the crown Queen Elizabeth II wore at her coronation, but it has probably been altered several times over the last 300 years. However, the new royal glamour was not confined to the King. Power, including power-dressing, and Art as displayed at the magnificent Restoration court were crucial in expressing and upholding Charles’s authority as monarch. He wanted his subjects to know that he was back, and intended to stay – and for them to be awestruck at his court’s magnificence. The ladies of the court had their part to play in this power game, too. Enter Barbara Villiers, wife of Roger Palmer, later Earl of Castlemaine, and mistress of Charles II. In 1662, she was made Lady of the Bedchamber to Charles’s Queen, Catherine of Braganza – and one feels sorry for poor Catherine being put in such a difficult position. Barbara bore Charles five children and, in 1670, was made Duchess of Cleveland. 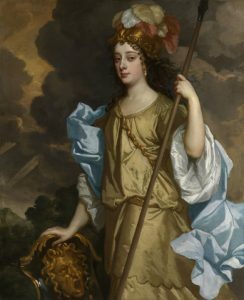 In the ‘Windsor Beauties’ portrait above, Sir Peter Lely painted her as Minerva, the Roman goddess of war and wisdom. She wears the 17th century version of a Classical gold chiton, and loose blue silken drapery floats about her. Her right hand rests on Minerva’s shield, decorated with Medusa’s head which turns whoever looked at it to stone. Barbara grasps a spear firmly in her left hand (a subtle indication that she has subdued the King?) and a plumed helmet sits on her loose and flowing curls. This portrait of Elizabeth Hamilton was one of Lely’s earliest ‘Windsor Beauties’ portraits to be completed. Elizabeth was one of the greatest beauties of the Restoration court and the portrait may have been painted to celebrate her marriage to Comte Philibert de Gramont in 1663. Here she is depicted as St Catherine, holding the martyr’s palm in her left hand and her right hand is held to her breast as if holding her clothes in place. The description says that there is a wheel (St Catherine’s symbol) in the shadows on her right but, I confess I can’t see it. St Catherine was called ‘the spiritual bride of Christ’, so depicting Elizabeth as St Catherine would have been both appropriate as a marriage portrait and also, perhaps, a flattering allusion to Queen Catherine of Braganza. Elizabeth and her husband left England and returned to France in 1664. What I find interesting here is the religious eroticism. St Catherine of Alexandria is a Roman Catholic saint (who may not have existed and would have been disapproved of by Puritans, anyway) and she is shown almost falling out of her dress. The viewer is getting mixed messages: look but don’t touch, perhaps. 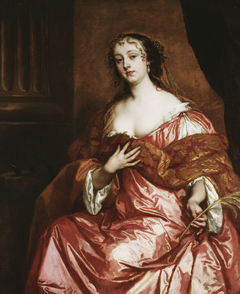 Lastly, we have Nell Gwyn, well known orange-seller, comic actress and mistress of Charles II. She doesn’t need to power-dress; she manages perfectly well wearing nothing at all – unless you count a pair of wings. She is holding one of Cupid’s arrows and we do not doubt that it will reach its desired target. 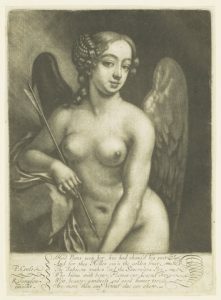 Nell’s portrait is a mezzotint, which meant that it could reach a wide audience – the famous diarist, Samuel Pepys, always an admirer of female beauty, owned a copy. And perhaps this is another reason why expanding his Art Collection was so important for Charles – we know he appreciated Old Masters featuring scantily-clad goddesses and nymphs – and admiring female pulchritude was one area where social class was irrelevant. In fact, a feeling for High Art might be almost be called aspirational. It is certainly anything but dull, sober and Puritanical. Fascinating insight. I am amazed to see how right you are about power dressing. Never thought of it like that, but you are absolutely correct in my view. It’s also visible in Elizabeth’s day – very much so in her portraits. But yes, the rebuttal to the puritans is total. Very interesting. Thank you for your comment, Elizabeth. I’m so glad you agree with me! And the beauty of it, from Charles’s point of view, is that its power is covert rather than being spoken out loud. And I agree with you about Elizabeth I’s portraits – she was a true mistress of the art of power dressing.